Hi! I'm Yuma! :D I love to draw and write stories! Jermemy Irons is one of the few actors to play in a Disney movie and not use a voice double for songs. though in the song be prepared he blew out his and Jim Cummings had to finish the song. The MOre You Know. nice profile and art, like mine? It's cute but it looks like you traced and the lines are a little shaky. I trace sometimes but not all the time. Thank-you Jalorda! ^_^ That's very nice of you! Who? the one with her and the butterfly on her nose? 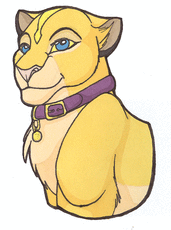 or MY character with the diamond+streak on her head? The one with the marking and blue eyes is my fursona Yuma!